TheUniversity of South Florida Contemporary Art Museum maintains the permanent collection for the University of South Florida. Established in the early 1960s with key purchases from the University's exhibitions program, the collection currently holds over 5,000 objects of contemporary graphics, works on paper, sculpture multiples and photography. Particular strengths for the collection include extensive gifts from Graphicstudio, the Martin S. Ackerman Foundation, Robert Stackhouse and the Andy Warhol Foundation for the Visual Arts. USFCAM maintains a substantial representation of Graphicstudio works, including developmental and process documentation materials. 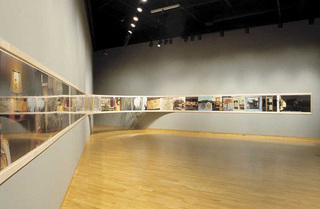 Founded in 1968 as a non-profit, university-based, collaborative art making facility, Graphicstudio at the University of South Florida, remains unique in its commitment to aesthetic and technical research in the visual arts. Leading artists are invited to work in the state-of-the-art studios in collaboration with expert artisans to create works on paper - including lithographs, etchings, photogravures, digital images, books - and sculpture multiples in a variety of materials. Graphicstudio is acclaimed for its research in advanced printing techniques. In recognition of its excellence, the National Gallery of Art in Washington, D.C., maintains the comprehensive archive of Graphicstudio editions. The collection at USFCAM holds at least one edition of each print or sculpture multiple that Graphicstudio has produced. In the mid 1980s the Martin S. Ackerman Foundation provided a generous donation of approximately 675 works of art. Comprised mostly of drawings, prints and photographs, this gift compliments the focus of the Contemporary Art Museum’s collection, while strengthening the range of media, styles, and artists represented. In 1991 Robert Stackhouse chose the University of South Florida Contemporary Art Museum to serve as the archive for his print multiples. Stackhouse is a Distinguished Alumnus of The University of South Florida and was awarded an honorary doctorate from USF in 2006. In 2008 USF organized a major exhibition for the archive, which resulted in publication of the catalogue raisonne Robert Stackhouse: Editions Archive. The catalogue is available through our website. In 2008, The Andy Warhol Foundation for the Visual Arts designated USFCAM as a recipient of a substantial gift from its Photographic Legacy Program. USFCAM received a curated selection of 106 original Polaroid photographs and 50 gelatin silver prints produced by Andy Warhol between 1970 and 1987. These images often served as the basis for the artist’s portraits, silk-screen paintings, drawings and prints. Helping to frame the context of the contemporary within a culturally diversified history of art, several small teaching collections of African and Pre-Colombian Meso-American artifacts are also maintained. While these teaching collection are not currently available online, information related to these and all aspects of the collection is available by contacting the University of South Florida Contemporary Art Museum directly.